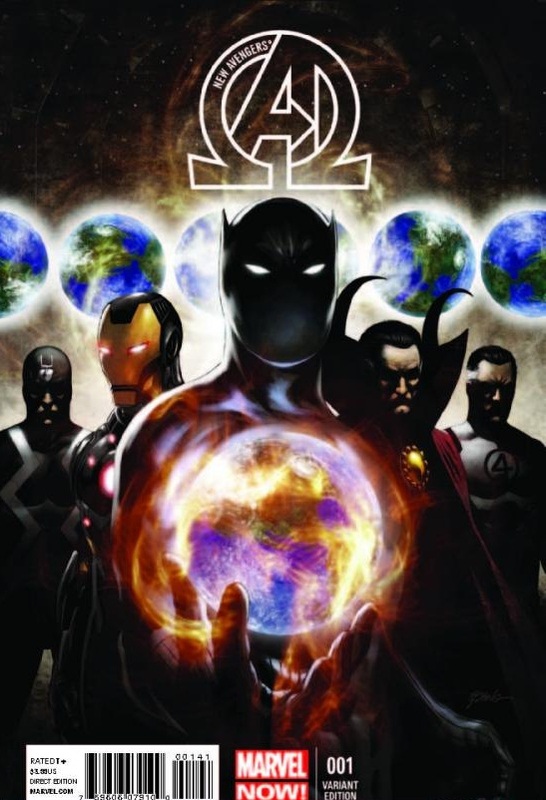 Set Up– Like Hickman’s other book Avengers (2013) #1 this issue is all about the set up. Why is the team coming together? Against what threat? + Why is T’challa forming the team since he knew that the original Illuminati team would cause more harm than good….what threat could be so great that he would knowingly enter a team with these men? Not mention Namor has betrayed him twice in the last ten years; Once when he was almost killed by Doom (See Black Panther #1 and Black Panther #2 for details) and during Avengers Vs X-men #8 and Avengers Vs. X-men #9 when he all but destroyed his nation. Dangerous and strange bedfellows indeed. What would the reigning Queen Shuri think of T’challa consorting with a wanted criminal and enemy of the state!? The Return of the King- Ok, it’s been a rough patch for Black Panther fans after “Most dangerous man alive” was cancelled early 2012. 2012 was a quite year for our boy until Fantastic Four #607 and Fantastic Four #608 and Avengers Vs X-men #8 and Avengers Vs. X-men #9 brought him back into the limelight all under the thumb of Jonothan Hickman. To say this issue builds on the importance of T’challa to the marvel universe is a bit of an understatement! 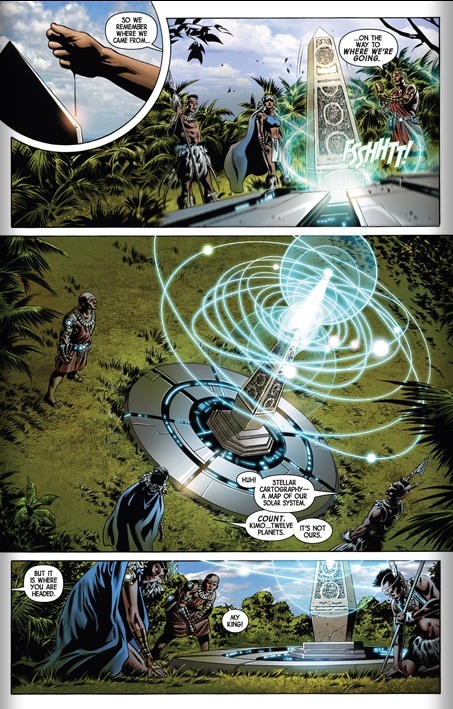 If the solicits are to be believed this is his team operating from Wakanda’s Necropolis (Introduced in Fantastic Four). 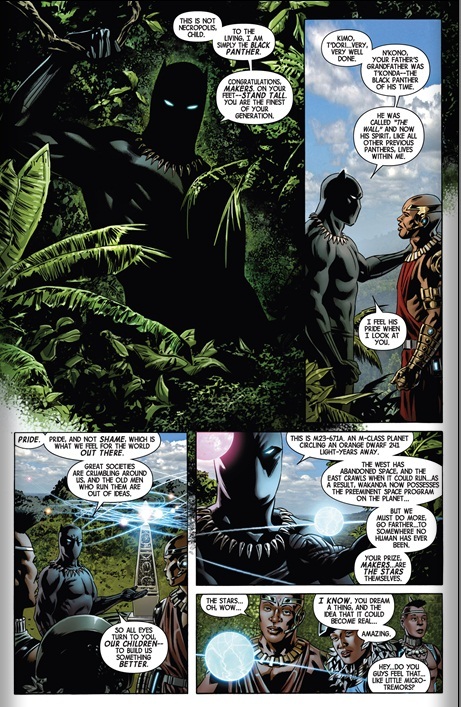 T’challa also gets allot of new toys thanks to Hickman; a teleportation device, a cloaking device, a costume that apparently can disappear and reappear at will or even parts and shied generation? More of this please! Art- Not perfect by any means but I like Steve Eptings strong line work and his action scenes are the highlight of this issue. His use of shadows is also to be complimented. Wakanda– I loved how Hickman handled the Wakandan elements, mixing nature, technology and classic African clothing and weaponry to make a culture Marvel execs think is “too far out there to make a movie”. I can’t wait to see where Hickman goes with this! Covers– Again a plain white cover with a logo and marvel is expecting us to pay the same price as a standard? Really!? The other bad cover was the A-babies which is neither cute nor….wait a minute! What the hell are A-babies anyway besides x-baby knockoffs which are even less popular? Goddess- Um……since when does T’challa say “goddess” every other sentence? Is this something he picked up from Storm? I mean it makes sense but…….was weird honestly. Villain- As interesting as the story was I found the design choice….a scantily clad albino chick with long hair wearing all black…..uninspiring. Honestly next issue we could say this was Emma Frost or any one of the myriad of scantily clad white women in comics and nobody would bat an eyelash. There also was no motivation given for her actions making her both uninspirng and uninteresting. I’m confused- Ok I was following the story until we hit the last page where the now (Classic) Illuminati arrive in Wakanda without Xavier (Who was killed in Avengers vs X-men #11). Why is Dr. Strange dressed as sorcerer supreme? Did he not lose the cloak etc to Doctor Voodoo? And were said items not destroyed along with Jericho Drumm (See New Avengers #6 for details)? Equally as confusing was Reed wearing his new white uniform but Cap was wearing his before avx costume???? WTF is happening here? When does this story take place? Dead already- (Shakes head) Sure it served the interest of the story and I really should not have gotten attached so quickly to the three new characters introduced at the start but DAMN Hickman you killed everyone already? I was looking forward to seeing them grow throughout the series, guess I better not. Touche Mr. Hickman! For all the Panthers book, his dialog, even in the pages above, still reads very stereotypical and feels like it was written by someone that watched too many stereotypical Africans village chiefs or Native American chiefs.. I was ready to cancel my subscription when Bendis left the series and Luke Cage left the group but I might have to stick around for a while to see how well the Black Panther’s role is written. I still think that only black writers should write for black characters cause white writers just don’t get our way of thinking and whether they honestly want to be objective or not,it always seems to come out ignorant,biased,or stereotypical. -Xavier is actually dead, he was murdered by Scott Summers during AvX. -Doctor Voodoo died and Dr. Strange got his title for protecting earth against Doctor Voodoo’s brother.